New Yorker staff writer Alan Burdick takes readers on a personal quest to understand how time gets in us and why we perceive it the way we do. Why Time Flies certainly does not answer our every question. And precisely for this reason it captures us. Because it opens up a well of fascinating queries and gives us a glimpse of what has become an ever more deepening mystery for humans: the nature of time ... [Burdick] is one of those praiseworthy journalists who have an acute sense of what is scientifically relevant, as well as an ability to translate the dry language of laboratory science into something that connects directly to our experience, emotions and daily questions ... The book is a wealth of stories and surprising facts, each page raising our curiosity and unveiling a novel aspect of our relation with temporality. ...fascinating and eclectic ... as his narrative draws to a close and Burdick turns inward, revealing more about his life with his children, his wife, his aging parents and his father in law — as well as more about his personal history, his struggles as a writer and his complex relationship with the past — we grasp that this has been a voyage through Burdick’s life as a man, husband, father, son, writer and mortal human. In this sense, Why Time Flies evokes another far-ranging, symbolic odyssey with an everyman protagonist, that modernist conversion of Homer’s 3,000-year-old, decade-long epic into James Joyce’s Ulysses ... We never get a full-on portrait of Burdick, more of a tantalizing silhouette, but it’s enough to make us realize that this mostly scientific journey through the world of time is also a voyage of self-discovery and finding one’s way back home. It’s a discursive book, full of literary references, bizarre scientific studies and personal anecdotes about Mr. Burdick’s twin baby boys, whose never-ending care reduces him at the book’s outset to a groggy fugue state ... One problem with studying psychological time is that it’s such a slippery concept ... Mr. Burdick has a talent for summing up several paragraphs of thought with pithy one-liners ... Confusion nevertheless seems inescapable in studying time, and readers expecting definitive solutions to longstanding mysteries may come away disappointed: Inside our minds, the cosmic debate between rigid and fluid time continues. But those who value rich questions more than easy answers, and can tolerate some uncertainty, will find Why Time Flies rewarding. 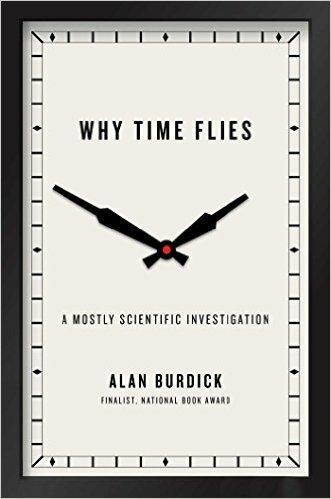 What did you think of Why Time Flies: A Mostly Scientific Investigation?